Do you tense your shoulders? Do you stiffen them when you ask for a transition? 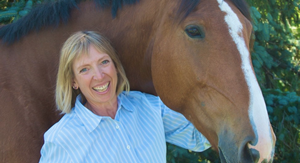 Do your hands stop following your horse making your rein contact hard and unpleasant? Here’s a quick warm-up exercise to mobilize and relax your shoulders. Photo 1. Imagine the face of a clock at the top of your upper arm with 12 o’clock at the top and 6 o’clock at the bottom. Next time you ride notice what happens to your shoulders. Do you have one higher than the other? Is one more forward? Do your shoulders draw together causing your hands to bounce up and down? Or do you feel tension between them when trying to pull your shoulders back? 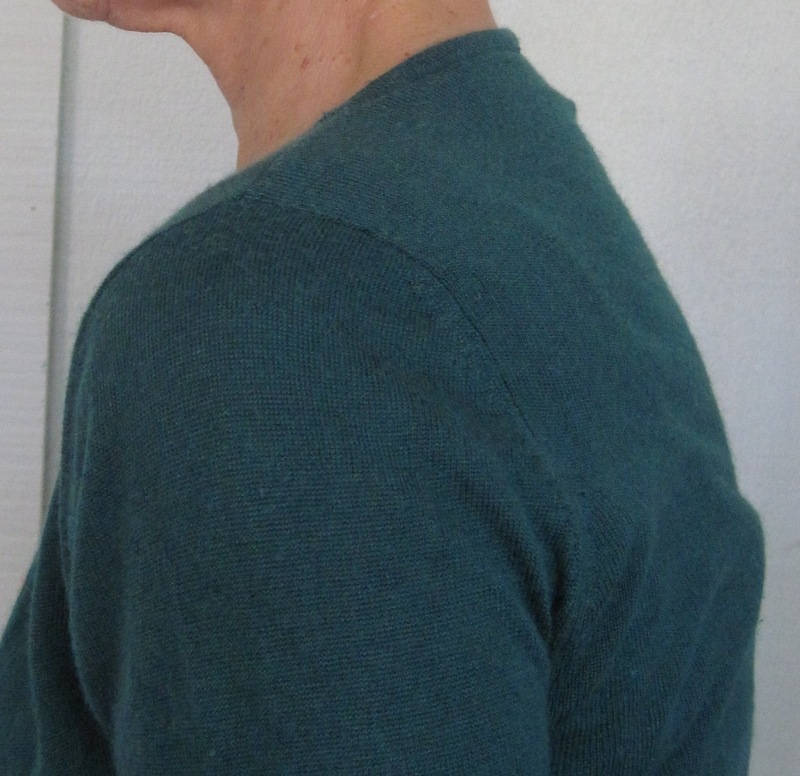 Your shoulders are ball and socket joints, similar to your hips. Due to the smaller socket there is greater mobility allowing you to move your arm in all directions. 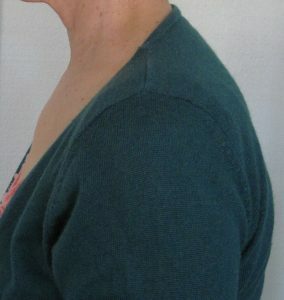 The socket is part of the shoulder blade. The ball is the end of the humerus or upper arm. The collarbone is the boney connection between the shoulder girdle and your ribcage. The shoulder joint is stabilized by a complex interaction of ligaments, tendons and muscles. 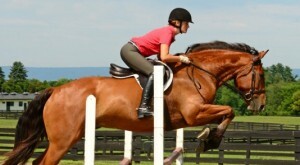 Riders often use too much muscle to keep the shoulders in the correct position. This makes rein contact with the horse’s mouth hard or unyielding. In order to have good contact you need to let your shoulder girdle rest on top of your ribcage. Photo 2. 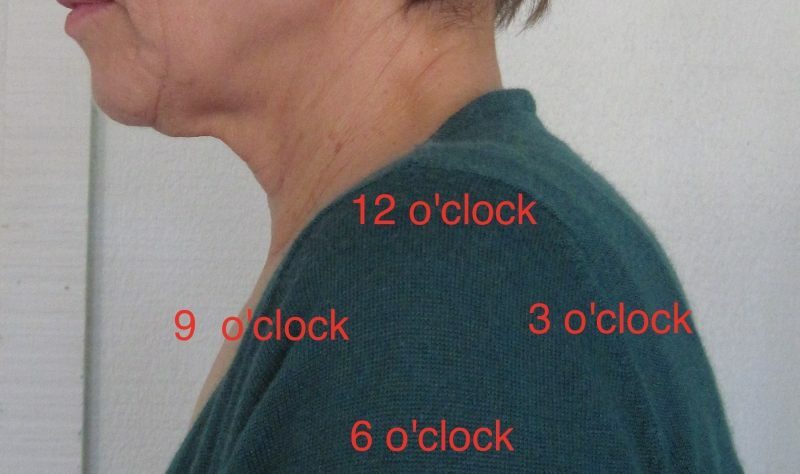 Move your shoulder down to 6 o’clock and up (not illustrated) in smooth small movements. 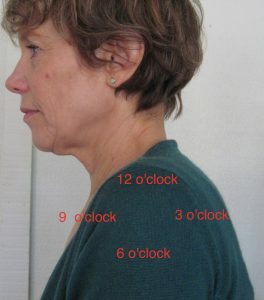 Begin to move your shoulder from 6 to 12 o’clock making very small movements. Do not go to your limit! This would be using too much muscular effort and is not the point. You want to explore the range that is easy to do. Go slow enough that the movement is smooth, without any jerking or jumping. Notice if you hold your breath as you do this. Rest and notice if the resting position of your shoulder is different than when you started? Move your shoulder from 3 to 9 o’clock again in small slow movements again without forcing. Continue going across the clock going from 11 to 5, 10 to 4, 3 to 9 and so on until you can go across the clock on each line smoothly and easily even if this is only one-quarter of an inch. Finally make small slow movements around the outside of the clock both clockwise and counter-clockwise. Rest and again notice if your resting position is different from your beginning position. Photo 3. Move your shoulder forward and back (not illustrated). Repeat with the other shoulder. If you want to challenge yourself, do one shoulder clockwise while the other goes counter clockwise. Rest and notice how your shoulders feel now. While mounted make very small shoulder clocks at walk, trot and canter. Let your shoulders rest and feel how the shoulder girdle sits on the ribcage. During transitions allow your shoulders to rest. 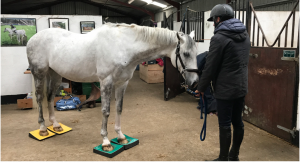 Use this Murdoch Minute both off and on your horse to relax your shoulders and allow them rest in the correct position rather than trying to hold them in place. When you eliminate the excess tension in your shoulders your contact to the horse’s mouth will be much softer and your horse will be able to respond to your aids more easily.